May 24, 2014 - PRLog -- After years of global economic turmoil, a growing number of people are feeling complete despair at their situation in life – feeling trapped in unhappy and unhealthy circumstances. Are we victims of fate? Definitely not, according to author Dr. Tiana Von Johnson. In her new book “The Mindset Makeover: How to Enhance Your Self-Worth to Increase Your Net-Worth”, Von Johnson explains how to recognize “negative prisons”, understand that it is in your mind and you have the power to escape it. Best of all, she provides a map for your escape route! Von Johnson explains, once you own your situation, speak life into a positive vision, you alone have the power to leave your past mentality. We are exposed to ideas from parents, teachers and others growing up, and sometimes those critical figures who influenced how we understand the world were pretty defeatist. They may have made an honest effort to prepare us for life’s harsh realities, but they did not give us the savvy navigation skills to avoid the rougher roads and cruise along the highway fueled with confidence and optimism. Explore your relationship with money, failure and leadership and learn how to dismantle the prison in your mind. In “The Mindset Makeover”, Von Johnsonteaches readers the 10 laws of mindsetmastery. Escape the povertytrap and build a new life plan brimming withpotential and hope. If you want to achieveand succeed in life, you have to start by changing yourself from the inside out. It isn’teasy, but Von Johnson makes both the big picture and the nitty gritty details clear. She also shares her own inspirational life story of transformation from a 9 to 5 worker, single mom escaping an abusive boyfriend to a successful business woman who shed negative surroundings once she mastered her thoughts. Dr. Tiana Von Johnson grew up in the Bronx, New York and earned her MBA as young single mother. 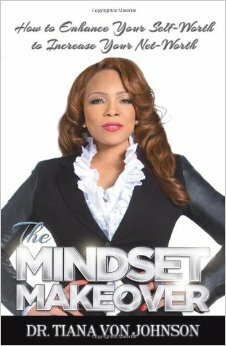 She is now a successful producer, author, sought-after mindset coach, real estate expert and creative visionary. Since starting two real estate firms, she has built a solid reputation as an astute dealmaker for entertainers, executives and everyday people seeking to build lucrative portfolios, and purchase, sell, rent or invest in real estate. Her Minority Investors Alliance (MIA) has hundreds of Ambassadors across the country helping her cause to empower and build minority millionaires across the country through real estate investing and entrepreneurship. In addition, Tiana produces The Power House Conference & Women Doing It Big, which is a national empowerment conference designed to motivate, educate and empower men and women across the world. 1. You must purchase the book directly from Amazon.com. If you purchased it from another source you will have to order another copy. 2. Email your receipt to bookclub@tianavonjohnson.com and include your name, phone number and occupation (the first 28 people only). 5. Leave your review on Amazon and qualify to win 4 free one-on-one coaching sessions. Roberta Fabiani-Skadek "2016 Designer of the Year: Inaugural Ceremonies for "UNLEASH YOUR ROAR"
Millennial Yoga Event Celebrates Brooklyn Wellness Program with Eddie Stern, DHerbs and others!